In-store and online with free click and collect. 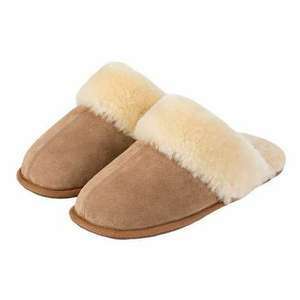 Crafted in tan suede and fully lined with soft sheepskin providing added warmth and comfort in the cooler months, these simple brown suede mule slippers are available in a choice of sizes. Totes are presented in a charming gift box. Saw these yesterday £12 in store. They say its an online exclusive! Ah thanks. Nearest store is 15 miles away so no saving. My mum is size 6 but takes a wide fitting. Wondering if I should get the M-L instead of the S-M. Awesome last minute gift for mum!!! How can I check stock on the product page pls if they are in-store as well?